Relatively few physiotherapists have expertise in treating pelvic pain syndromes and pelvic dysfunction. A small, but growing, number of therapists are receiving specialised training in this area. Thus having two physiotherapists in the same practice with experience in treating these conditions is rare. Not only that but both Sonja Fitzpatrick and Sue Fernihough (Chartered Physiotherapists) have suffered from this painful and debilitating condition during their second pregnancies. They therefore have a special interest in this condition and have the utmost sympathy for patients suffering from this pain. This condition is most commonly associated with pregnancy and childbirth. It is a condition that causes excessive movement of the pubic symphysis, either anterior or lateral, as well as associated pain, possibly because of a misalignment of the pelvis, S.P.D. is a dysfunction that is associated with pelvic girdle pain and the names are often used interchangeably. It is thought to affect up to one in four pregnant women to varying degrees, with 7% of sufferers continuing to experience serious symptoms postpartum. Although the condition was recognised by Hippocrates, incidences of S.P.D. appear to have increased in recent years; it is unclear whether this is because the average maternal age is increasing, or because the condition is being diagnosed more frequently. 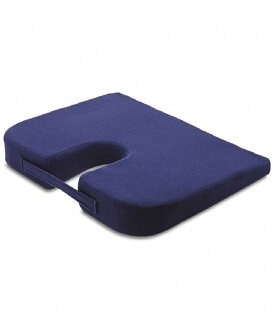 Use of a maternity brace is usually necessary depending on the severity of the pain. 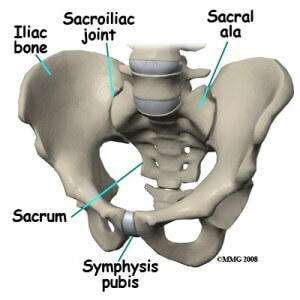 The sacroiliac joint or S.I.J. is the joint in the bony pelvis between the sacrum and the ilium of the pelvis, which are joined by strong ligaments. In humans, the sacrum supports the spine and is supported in turn by an ilium on each side. The joint is a strong, weight bearing synovial joint with irregular elevations and depressions that produce interlocking of the two bones. The human body has two sacroiliac joints, one on the left and one on the right, that often match each other but are highly variable from person to person. The hormonal changes of menstruation, pregnancy, and lactation can affect the integrity of the ligament support around the S.I.J., which is why women often find the days leading up to their period are when the pain is at its worst. During pregnancy, female hormones are released that allow the connective tissues in the body to relax. The relaxation is necessary so that during delivery, the female pelvis can stretch enough to allow birth. This stretching results in changes to the S.I.J.s, making them hypermobile (overly mobile). Over a period of years, these changes can eventually lead to wear and tear or arthritis. As would be expected, the more pregnancies a woman has, the higher her chances of S.I. joint problems. During the pregnancy, micro tears and small gas pockets can appear within the joint. Muscle imbalance, trauma (e.g. falling on the buttock) and hormonal changes can all lead to S.I.J. dysfunction. Sacroiliac joint pain may be felt anteriorly, however care must be taken to differentiate this from hip joint pain. A number of different conditions can cause pain in the general area of the coccyx, but not all involve the coccyx and the muscles attached to it. The first task of diagnosis is to determine whether the pain is related to the coccyx by physical examination. Contrary to most anatomical textbooks, most coccyxes consist of several segments: ‘fractured coccyx’ is often diagnosed when the coccyx is in fact normal or just dislocated at an intercoccygeal joint. Manually working on tight, painful muscular structures such as the levator ani, coccygeus, or piriformis muscles. Myofascial release techniques may be used. Local electrotherapy modalities also may be helpful.